The illumination of the page (93 v.) depicts the Birth of St John the Baptist and the Baptism of Christ. 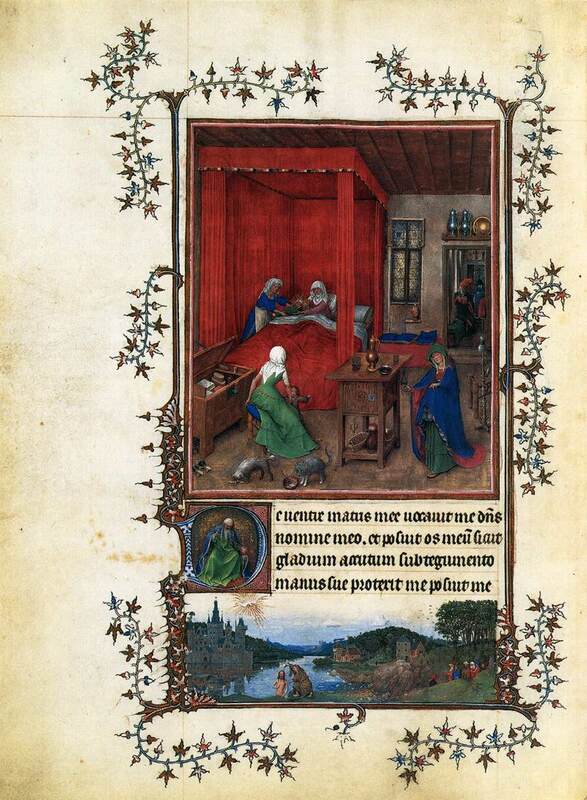 The former shows St Elizabeth in her lying-in room after the birth of St John the Baptist. Beyond Elizabeth fully furnished room, which includes attendants, a child, and a couple of household pets, are two smaller rooms; in the first, well-windowed one St Zacharias is seated writing his son’s name in a book (Like 1:57-63), and in the second there is a woman seen from the rear – she may be washing up. The Turin-Milan Hours, whose illustrations scholars once attributed to Jan van Eyck, combines superb landscapes, accurate, spatially correct interiors, and ornamental borders familiar from the work of Jean Pucelle. John’s parents were Elizabeth the cousin of the Blessed Virgin Mary and Zachary a temple priest whose job was to burn incense. Zachary and Elizabeth were quite old when one day an angel of God appeared to Zachary in the temple. The angel told him that his wife would bear a son who would be filled with the Holy Spirit at his birth. The child should be named John. Zachary found this difficult to believe and God punished him by taking away his voice. He remained dumb until after John’s birth. Eight days after John was born his parents took him to the temple where he would be named Zachary, after his father. But both Elizabeth and Zachary asked for the child to be named John. Immediately, Zachary’s tongue was loosened and got back his voice. John had a special job to do for God. He was going to prepare the way for the coming of Jesus. So when he was still young, about twenty-seven, he went into the desert to prepare himself with silence, prayer and penance. He wore a tunic of camel hair with a leather belt and lived on wild honey and locusts (the locust tree is an evergreen that has edible bean like pods). Soon crowds started to come to him. They realized he was a holy man. He warned them to be sorry for their sins and asked them to change their lives. He baptized them with water and gave them the baptism of repentance. One day, Jesus himself came to John. He wanted to be baptized with John’s baptism to begin making up for our sins. On that day, John told the crowds that Jesus was the Messiah, the one they had been waiting for. He told them and everyone else to follow him. Later on, St. John learned that King Herod had married Herodias a woman who already had a husband and a daughter. This king was the son of the King Herod who had murdered all those little boys in Bethlehem. St. John told him that it was wrong for him to live with that woman. King Herod was angry and humiliated. He locked John up in prison and John remained in a dark, damp dungeon for a long time. Then on Herod’s birthday Herodias’s daughter danced beautifully at his banquet. The delighted Herod said he would grant her any she wished. At her mother’s request, she asked for the head of John the Baptist on a platter. The shocked Herod had not choice and sent his executioner to kill John and bring back his head. When his disciples heard about it, they immediately came and took his body and laid it in a tomb. Jesus said, “I am the Truth” and John died for the truth. St. John’s motto was, “Jesus must become more and more. I must become less and less.” He said that he was not even worthy to loosen the strap of Jesus’ sandal. until after his son’s birth. Grant, we pray, almighty God, that your family may walk in the way of salvation and, attentive to what Saint John the Precursor urged, may come safely to the One he foretold, our Lord Jesus Christ, Who lives and reigns with you in the unity of the Holy Spirit, one God, for ever and ever. This feast, a segment of Advent in the season of Ordinary Time, makes us aware of the wonderful inner relationship between the sacred mysteries; for we are still in the midst of one Church year and already a bridge is being erected to the coming year of grace. “Apart from the most holy solemnity commemorating our Savior’s birth, the Church keeps the birthday of no other person except that of John the Baptist. [The feasts of the Immaculate Conception and of the Nativity of the Blessed Virgin had not yet been introduced.] In the case of other saints or of God’s chosen ones, the Church, as you know, solemnizes the day on which they were reborn to everlasting beatitude after ending the trials of this life and gloriously triumphing over the world. The Christmas season has for its object the mystery of God-become-Man, to which there is reference only now and then during the remaining part of the year, e.g., on Marian feasts, especially that of the Annunciation (March 25) and today’s feast in honor of the Baptist. In a sense, then, we are celebrating Christ’s incarnation today. The birth of Jesus is observed on December 25 at the time of the winter solstice, while the birth of His forerunner is observed six months earlier at the time of the summer solstice. Christmas is a “light” feast; the same is true today. The popular custom centering about “St. John’s Fire” stems from soundest Christian dogma and could well be given renewed attention. St. John’s Fire symbolizes Christ the Light; John was a lamp that burned and shone. We Christians should be the light of the world. Today is also the Feast of the Immaculate Heart of Mary. We are given the story of the ministry of John the Baptist, called the Precursor or Forerunner of the Lord, with some variation of detail, in the three synoptic Gospels of Matthew, Mark, and Luke, as well as in the Book of John. Luke tells us of the birth of John the Baptist in a town of Judaea, about six months before the birth of the Saviour. The attendant circumstances, which we have already recounted under the headings of and , his parents, suggest the miraculous and wonderful. 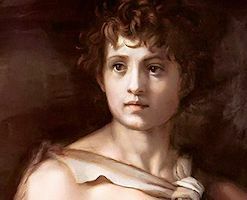 The New Testament tells us nothing of John’s early years, but we know that his pious, virtuous parents must have reared the boy with care, conscious always of the important work to which he was appointed, and imbuing him with a sense of his destiny. The rite of baptism, a symbolic act signifying sincere repentance as well as a desire to be spiritually cleansed in order to receive the Christ, was so strongly emphasized by John that people began to call him “the baptizer.” The Scriptures tell us of the day when Jesus joined the group of those who wished to receive baptism at John’s hands. John knew Jesus for the Messiah they had so long expected, and at first excused himself as unworthy. Then, in obedience to Jesus, he acquiesced and baptized Him. Although sinless, Jesus chose to be baptized in order to identify Himself with the human lot. And when He arose from the waters of the Jordan, where the rite was performed, “the heavens opened and the Spirit as a dove descended. And there came a voice from the heavens, Thou art my beloved Son, in Thee I am well pleased” (Mark i, 11). John’s life now rushes on towards its tragic end. In the fifteenth year of the reign of the Roman emperor, Tiberias Caesar, Herod Antipas was the provincial governor or tetrarch of a subdivision of Palestine which included Galilee and Peraea, a district lying east of the Jordan. In the course of John’s preaching, he had denounced in unmeasured terms the immorality of Herod’s petty court, and had even boldly upbraided Herod to his face for his defiance of old Jewish law, especially in having taken to himself the wife of his half-brother, Philip. This woman, the dissolute Herodias, was also Herod’s niece. Herod feared and reverenced John, knowing him to be a holy man, and he followed his advice in many matters; but he could not endure having his private life castigated. Herodias stimulated his anger by lies and artifices. His resentment at length got the better of his judgment and he had John cast into the fortress of Machaerus, near the Dead Sea. When Jesus heard of this, and knew that some of His disciples had gone to see John, He spoke thus of him: “What went you to see? A prophet? Yea, I say to you, and more than a prophet. This is he of whom it is written: Behold I send my angel before thy face, who shall prepare thy way before thee. For I say to you, amongst those that are born of women there is not a greater prophet than John the Baptist” (Matthew xi, 10-12). Herodias never ceased plotting against the life of John, who was not silenced even by prison walls. His followers now became even more turbulent. To Herodias soon came the opportunity she had long sought to put an end to the trouble-maker. On Herod’s birthday he gave a feast for the chief men of that region. In Matthew xiv, Mark vi, and Luke ix, we are given parallel accounts of this infamous occasion which was to culminate in John’s death. At the feast, Salome, fourteen-year-old daughter of Herodias by her lawful husband, pleased Herod and his guests so much by her dancing that Herod promised on oath to give her anything that it was in his power to give, even though it should amount to half his kingdom. Salome, acting under the direction and influence of her wicked mother, answered that she wished to have the head of John the Baptist, presented to her on a platter. Such a horrible request shocked and unnerved Herod. Still, he had given his word and was afraid to break it. So, with no legal formalities whatever, he dispatched a soldier to the prison with orders to behead the prisoner and return with it immediately. This was quickly done, and the cruel girl did not hesitate to accept the dish with its dreadful offering and give it to her mother. John’s brief ministry was thus terminated by a monstrous crime. There was great sadness among the people who had hearkened to him, and when the disciples of Jesus heard the news of John’s death, they came and took the body and laid it reverently in a tomb. Jesus, with some of his disciples, retired “to a desert place apart,” to mourn. The Jewish historian Josephus, giving further testimony of John’s holiness, writes: “He was indeed a man endued with all virtue, who exhorted the Jews to the practice of justice towards men and piety towards God; and also to baptism, preaching that they would become acceptable to God if they renounced their sins, and to the cleanness of their bodies added purity of soul.” Thus Jews and Christians unite in reverence and love for this prophet-saint whose life is an incomparable example of both humility and courage. Excerpted from Lives of the Saints, Published by John J. Crawley & Co., Inc.
Patron: Baptism; bird dealers; converts; convulsions; convulsive children; cutters; epilepsy; epileptics; farriers; hail; hailstorms; Knights Hospitaller; Knights of Malta; lambs; Maltese Knights; lovers; monastic life; motorways; printers, spasms; tailors; Genoa, Italy; Quebec; Sassano, Italy; Diocese of Savannah, Georgia; Diocese of Charleston, South Carolina; Diocese of Dodge City, Kansas; Diocese of Paterson, New Jersey; Diocese of Portland, Maine. Symbols: Lamb; lamb on a book of seven seals; locust; camel’s hair tunic; girdle; his head on a charger; scroll with words Ecce Agnus Dei or with Vox Clamantis in deserto; long, slender cross-tipped staff; open Bible; banner of victory. Read about the traditions connected with this feast, particularly the connection with bonfires. The Liturgy of the Hours for the Evening Prayer (Vespers) of the Birth of St. John the Baptist has traditionally included the Gregorian chant Ut Queant Laxis. Tradition has ascribed the hymn to a Paul Warnefried (Paul the Deacon, 730-799). While preparing to sing the Exsultet at the Holy Saturday vigil, he found himself hoarse, and so prayed to St. John the Baptist, since his father lost his voice before John was born. Paul’s voice was restored and he wrote this hymn in honor of the saint. True or not, what makes this song memorable is that the Benedictine monk used this hymn as a pivotal reference for our musical scale. See Catholic Encyclopedia’s entry Ut Queant Laxis, more information on the hymn from Catholic Culture, a Beginner’s Guide to Modal Harmony, and Gregorian Chant Notation. The Church year has two cycles. The more important cycle is the Temporal cycle (from the Latin tempus which means time or season). The life of Christ is relived in liturgical time, in both real time and Church’s memory. Throughout the year the Paschal Mystery (Christ’s work of redemption through His birth, life, passion, death, and resurrection and ascension) is relived, and broken down into the seasons of Advent, Christmas, Lent, Holy Week, Easter and Ordinary Time. Sundays are the usual means by which this cycle unfolds.At the same time with the temporal cycle, the Sanctoral cycle (from the Latin sanctus which means saint) progresses. The Church honors Mary, Mother of God “with a special love. She is inseparably linked with the saving work of her son” (CCC 1172). Then the memorials of martyrs and other saints are kept by the Church. They are held up to us as examples “who draw all men to the Father through Christ, and through their merits she begs for God’s favors” (CCC 1173). This is one of the few saint feast days that is connected with the temporal calendar, not the sanctoral calendar, because John the Baptist was intimately involved in Christ’s work of redemption. Charting or making your own liturgical calendar would be a great family project. 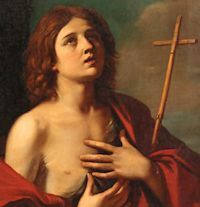 Read the excerpt from the Directory on Popular Piety on the cult of St. John the Baptist. In Brazil, this day is known as Diário de Sáo Joáo (Saint John’s Day). The festivities are set off in the villages and countryside by the Fogueira de Sáo Joáo (bonfire) on St. John’s eve. Families and friends eat traditional foods around the fire while younger folks jump over the fire and firecrackers are exploded. The day is primarily a festival for children, who save up months in advance to purchase fireworks to set off for the day. In cities this is a day for parties and dances, with the urban dwellers dressing up in rural costumes.St. John is the protector of lovers, so for fun, young country girls in Brazil will roll up scraps of paper, each bearing a name of a single girl and place them into a bowl of water. The first one which unfolds indicates the girl who will marry first. Isn’t this a beautiful psalm for today’s feast? It’s not hard to picture John the Baptist praying these words and finding his own life story in this psalm. Surely Zechariah, his father, told him the story of his miraculous conception and how God had set him apart in Elizabeth’s womb. Surely John was convinced that God had given him just the right gifts and talents that would help him accomplish his mission. “Father, you know everything. You know my past and my future, what I have done and what I will do. You even know things about me that I don’t know myself. You know how I think and react, what trips me up and what spurs me on—and you always help me. “You know the times when I move forward, where I am headed, and all the paths that I will take to arrive there. You know whether I stride purposefully or wander confused or stagger through the difficult events of life. I trust that one day I will be where you mean me to be. “Sometimes my way seems aimless and directionless. Yet you are never startled or caught unaware. You know all my thoughts before I have even conceived them, and you understand all of them. You know my soul and my motivations better than I do myself. “You know the times when I rest, simply staying still, not moving forward at all. Journeying or resting, I am known and loved by you, made wonderfully for your plans and your delight. “You know my heart and its ways too. You are familiar with them all, and you correct me, little by little, ever so gently, when I stray. You watch over me continually, as a parent watches a toddler learning to walk. “Lord, you love me! You know everything about me, and you love me anyway, showing me off as one of the marvels of your creation. I am wonderfully made! John the Baptist leapt in the womb when Mary greeted his mother, Elizabeth. What a joyful scene! Pray for couples expecting children today, and for those who await this blessing. June 24, 2017 – What’s in a Name? When the time arrived for Elizabeth to have her child she gave birth to a son. Her neighbors and relatives heard that the Lord had shown his great mercy toward her, and they rejoiced with her. When they came on the eighth day to circumcise the child, they were going to call him Zechariah after his father, but his mother said in reply, “No. He will be called John.” But they answered her, “There is no one among your relatives who has this name.” So they made signs, asking his father what he wished him to be called. He asked for a tablet and wrote, “John is his name,” and all were amazed. Immediately his mouth was opened, his tongue freed, and he spoke blessing God. Then fear came upon all their neighbors, and all these matters were discussed throughout the hill country of Judea. All who heard these things took them to heart, saying, “What, then, will this child be?” For surely the hand of the Lord was with him. The child grew and became strong in spirit, and he was in the desert until the day of his manifestation to Israel. Introductory Prayer: Lord, I make this effort at prayer for the sake of my soul and the souls of my loved ones. I believe that you died for us and want us to be with you forever in heaven. Petition: Grant me new respect, Lord, for parents. 1. Bundle of Joy: The arrival of a new baby has been a source of joy throughout the ages. Babies are God’s way of saying the world should go on. 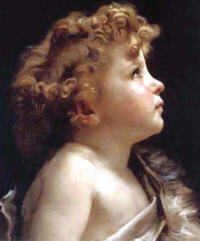 Each new child reflects a facet of the infinite beauty and mystery of God. And by teaching us patience and selflessness, the little ones help us grow in holiness. In their childlike simplicity they teach us to remain simple. Their neediness can, and should, soften our hearts. They don’t even have to be our own children; we can feel an obligation to help all kids, since their lives enrich all of us. What have I done lately to help the little ones, born and unborn? Is there a crisis-pregnancy center that could use help? Have I spoken well of parents who are open to large families? 2. God’s Choice: For the ancient Jews a name captured, even defined, a person’s identity. So for Elizabeth to name her son “John” was significant. It showed her recognition of God’s great plan for the child. John was in the Almighty’s special care from the start. Even today, each and every child is loved by God and has a destiny in the heavenly Father’s plan. Each has a vocation, a calling, in the Church. Do I appreciate the role that little ones have in God’s plans? Do I respect their dignity? Or do I try to impose my prejudices on them? They are tomorrow’s adults. How will I want them to remember my example? 3. Loosened Lips: Zechariah had doubted God and was struck mute. He regains his speech only after publicly accepting God’s plan and allowing his newborn son to take the name John. We, too, might have a bit of Zechariah in us. We resist God, only to hit a dead end. Bad friendships, habits of serious sin, rising despair – all of these can eat away at us. Yet, repentance is slow to come. Why? “We think that evil is basically good,” said Pope-Emeritus Benedict XVI (December 8, 2005). “We think that we need it, at least a little, in order to experience the fullness of being. … If we look, however, at the world that surrounds us we can see that this is not so; in other words, that evil is always poisonous, does not uplift human beings, but degrades and humiliates them.” Am I resisting God’s plans? Conversation with Christ: Lord, you have put family members and other loved ones in my life for a reason. I’m to help them get to heaven, and they are to help me do the same. Remind me of this truth, and help me in a special way not to interfere with the plans you have for the children in my life. Resolution: I will pray a decade of the rosary that all my family members reach heaven.